NeuroLogica, a subsidiary of Samsung Electronics Co., Ltd., has been selected as the Bronze Winner in the “Radiological, Imaging, and Electromechanical Devices” category of the 20th Annual Medical Design Excellence Awards competition for its OmniTom mobile 16-slice CT scanner. The honor was presented to NeuroLogica at the MDEA Ceremony on June 12, 2018, in conjunction with the MD&M East Conference in New York City. The MDEAs are the medical technology industry’s premier design competition committed to searching for the world’s highest caliber finished medical devices, products, systems, or packaging available on the market. The awards program celebrates the achievements of the medical device manufacturers, their suppliers and the many people behind the scenes—engineers, scientists, designers and clinicians—who are responsible for the cutting-edge products that are saving lives; improving patient healthcare and transforming medtech—one innovation at a time. The 2018 MDEA Juror Panel selected 42 exceptional finalists in nine medical technology product categories. Products were judged based on design and engineering innovation; function and user-related innovation; patient benefits; business benefits and overall benefit to the healthcare system. Unlike other design competitions that are merely styling contests, the MDEA jury is comprised of a balance of practicing doctors, nurses and technicians alongside industrial designers, engineers, manufacturers and human factors experts. 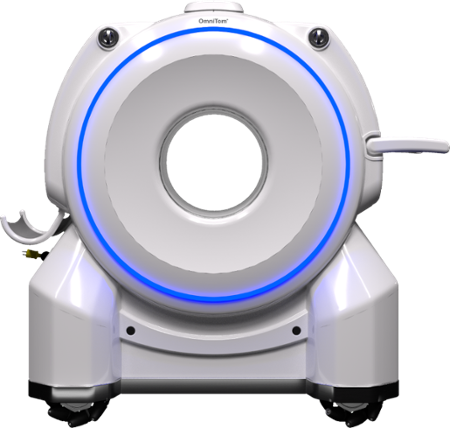 As described in a company press release, the OmniTom is the first medical device delivering high quality non-contrast CT scans at the patients’ bedside with omni-directional wheels, collecting real-time data on critically ill patients. The OmniTom is intended to improve the hospital’s workflow efficiency goals by eliminating the need to transfer patients to the Radiology Department, reducing potential risks associated with moving patients, as well as reducing the time it takes to produce a scan by more than half. In addition to improving safety, OmniTom delivers high quality non-contrast axial and helical CT, CT angiography scans at the point-of-care. The combination of rapid scan time, ultra-small footprint and immediate image viewing makes the OmniTom an indispensable tool when caring for critically ill patients. NeuroLogica’s OmniTom Mobile 16-slice CT scanner receives design award. Appl Rad Oncol.